An amazing day of highs and... more highs! This challenge run will see you crossing the breadth of rugged and exciting Snowdonia and summiting the 15 highest peaks in Wales. Each one of them over 3000ft, and grouped into three distinct ranges of hills; the Snowdon Massif, the Glyders, and The Carneddau. We begin this epic challenge on the Snowdon Massif starting with the mighty Crib Goch before going on to Crib y Ddysgl and of course Wales highest peak Yr Wyddfa - not a bad start to any mountain challenge. Then it’s down and across to the Glyderau range where we literally rise up to the challenge of Elidir Fawr, Y Garn, Glyder Fawr and Castell y Gwynt and Tryfan. After a quick refuel in the valley bottom we embark on our third range of hills on our challenge - Carneddau. Our path now takes on to Pen yr Ole Wen, Carnedd Dafydd, Carnedd Llewelyn, Yr Elen, Foel Grach, Garnedd Uchaf (yes, we do all 15 peaks over 3000ft) and finally Foel-fras - Congratulations, you’ve just completed one of the toughest and arguably the most spectacular mountain challenge in the United Kingdom. Now for a big feed and a stiff drink. Our run is planned to take approx. 18 hours for the full day and will be strenuous, so make sure you pack plenty of food! Accommodation is not included in the price. Please contact Adventure Café if you would like us to assist in booking your accommodation for the event. 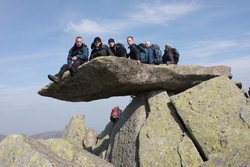 What is a Level 5.0 Trekking Challenge Like? For all of these events, we need to have a thorough referral on your fitness and endurance levels. These are serious challenges, and need to be approached seriously. You should have a lengthy history of completing challenges, and we shall ask for details and timings of your previous events. Trekking or running days can last up to 16 hours (running would be less), and can have extreme levels of hill climbing. You need excellent leg strength, endurance, and aerobic capacity. You will also need excellent resilience, in the face of altitude, the weather, as well as the normal physical nature of the challenge. Often these events involve some form of running - or at least fast movement over the ground. You should have good, well tested equipment, to suit the event you are taking part in. How Fit Do I need to be to join a Level 5.0 ‘Trek’? You consider yourself to have a very good to excellent level of fitness and endurance. You regularly push your limits and undertake strenuous exercise regularly. You must be capable of running 15km inside 90 minutes. If you go out walking in the English countryside, a walk of 8 hours and 22 miles should not present you with any difficulty. You should be able to walk up steep hills fast, and for long periods, climbing a peak like Ben Nevis via the tourist path should be easy to you, and you should enjoy striding fast up the climb. 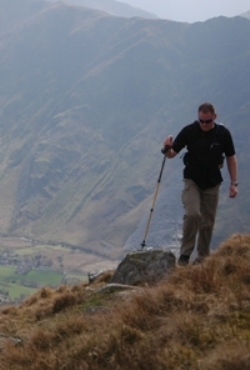 You would be able to climb Snowdon in under 1 hour and 45 minutes via the Miners or Pyg Track. You should also be very well prepared in terms of your personal equipment, especially your boots. You should be used to running reasonable distances each day to contemplate this run. It requires stamina and good aerobic fitness - but good willpower will also come in handy! Failure to disclose medical conditions is a serious omission - that could have serious repercussions on any of our challenges. Guiding during the Run, Emergency equipment, Full pre-event support. Due to Snowdonia’s position on the Western Seaboard it bears the brunt of prevailing weather systems coming in moisture laden from the Atlantic. At this time of year the weather could go either way from warm temperatures to freezing cold – so be ready for anything – make sure you pack according to the list! Remember that layers are the key, allowing you to adjust your level of warmth more easily.We will almost certainly experience some rain during the run, so make sure you have suitable waterproof gear both top and leggings.